This decorative black velvet masquerade mask is perfect for Mardi Gras, Masquerades, and other costumes parties. The black veil gives it a Middle Eastern harem girl look. 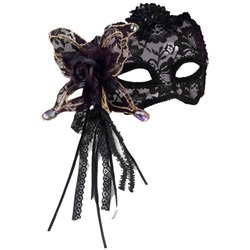 The black lace Venetian Mardi Gras mask is made of rigid plastic covered in black velvet with silver trim and attached decorative feathers and black lace veil. The mask features a flexible headband for secure fit to any head size. One size fits all, colored as pictured.